PlaceFull is getting a makeover! We made the six below changes to make it easier to manage your bookings and you’ll see them in your dashboard early Friday morning. If you still have questions, please sign up for the webinar at the bottom of this post. This feature was requested in the survey we sent out a couple weeks ago. We tried to solve for the question “what bookings do I have today?” Below, you will notice a high-level view of your three-day schedule. Click on the booking to see more information. Tip: You’ll also notice the navigation is now at the top of your dashboard. If you use the PlaceFull point of sale system, keep reading. The two places you can locate this are highlighted with the red arrows below. The actual process of running a point of sale booking remains the same. We created a dedicated landing page for all of our merchants. Click on the “Preview All” button to see your customized page! Don’t hesitate to promote this page across your social media channels. This feature used to be at the bottom of the dashboard. Log in to your account and click the drop down in the top right corner of the dashboard. You can still easily send an email to customer who booked a specific listing and export all your booking data. The listing process is still the same. The major difference is that the customer doesn’t have to enter their credit card information at checkout. Instead, they are just scheduling a time/date and then pay on the day of the appointment. We removed some clutter from the calendar so it’s easier to manage. We did move the “Block Off” feature if you want to block off an unavailable time so customers can’t book it. See the screenshot below. You will still have the ability to click on a day to create an unavailable time. We hope all these changes make it easier to create new listings and manage your business. If you would like to learn more about the changes, Watch the webinar below. 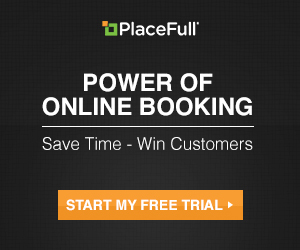 PlaceFull Got a Makeover – Webinar from PlaceFull on Vimeo. As always if you have any questions, please don’t hesitate to call 206-624-0296 or email us at sales@placefull.com. Happy Bookings! Categories: Merchant "How To's", Merchant News | Permalink.